Can you confirm these amateur observations of Liolaemus molinai? Type locality: Farellones de Tara, Loa Province, Antofagasta Region, Chile. 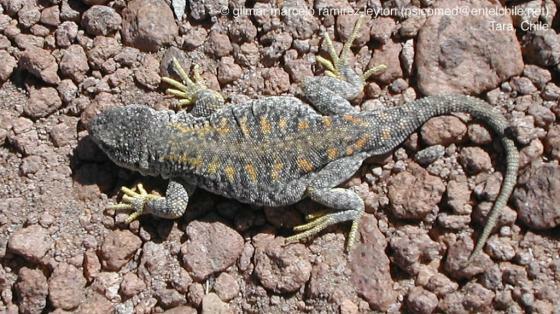 Comment Within the montanus group, the new species differs from the boulengeri group in lacking a patch of enlarged scales on the posterior thigh. It differs from the remaining species of the montanus group in having a high number of small, smooth, rounded dorsal body scale and differentiated head scales. From those species with similar pattern of squamation, the new species can be differentiated by its moderate size, tail shorter than snout - vent length, and distinctive color pattern. It has psammophilus habits and it occurs over 4,000 m of elevation. Synonymy: PINCHEIRA-DONOSO & NÚÑEZ 2005 and PINCHEIRA-DONOSO et al. 2008 considered L. molinai as a synonym of L. schmidti, a decision that is rejected by LOBO et al. 2010. It is possible that L. molinai is a synonym of L. erguetae (R. Langstroth, cited in TRONCOSO-PALACIOS 2014).